I’m setting myself ten minutes for this one because it’s really not what I want to be doing on a Friday night. But here are some of the issues I want to put to bed about Mantle of the Expert. I was somewhat astonished last night to see it dismissed by a secondary Maths teacher as ‘insane’ and by a Conservative counsellor as ‘dismal’ based on a brief perusal of a web site. It’s not just that it’s not very scholarly, or that it’s rude, though these reactions are both anti-intellectual and dismissive, but that no-one criticising it seemed to have the slightest idea of what it is. Said maths teacher even put it in a blogpost alongside the hugely discredited Brain Gym as if waving your arms around and pressing your belly is in some way comparable to high level inquiry led, knowledge based thinking. As with any tool for classroom practice, MoE is great for some contexts and not for others. I wouldn’t teach children to read using MoE or to learn their times tables. But we would read in MoE and do calculations as the context demanded. Most primary schools who use it consistently and well, spend between 40-60% of their time in Mantle and the rest in activities like Synthetic Phonics, Numeracy, PE and Guided Reading. So why bother? Well, there are no large scale RCTs to suggest it ‘works’ – the idea of the work being measurable is a bit of an anathema but primaries like Woodrow and Bealings do report significant rises in results and Bealings has been consistently rated outstanding by Ofsted for over a decade. A project I worked on at a secondary school in Huddersfield showed that children exploring their Science, Maths and English topics in Year 8 through a combined MoE project, outperformed their peers in all three subjects in end of unit tests, with teachers reporting that the gains were so noticeable that they could ‘spot’ the children who had been involved a year later without being told who had been in the project group. Another, in Barnsley saw GCSE A-C grades rise by 40% for the year group that had been taught through MoE. Of course, these are small scale experiences in single setting and don’t really mean anything. But it’s irrelevant. You don’t do mantle to improve results – you do mantle to build general knowledge, vocabulary, responsibility, relationships, connected thinking, playfulness and seriousness. If there are side effects of performing better in tests, then whoopeedoo, but this is a philosophy not an intervention. Right, my husband is home. Wine is in the fridge. Ten minutes are up. I think being a teacher is a bit like being a stone mason. If you went up to a stone mason while he was working and suggested that he should change the way he worked as there was an RCT that suggested the best way to carve stone was to hold the chisel at 30%, he would nod politley and carry on doing his magic with a smile. People like OA will tell you you are rubbish at what you do. Simply nod, smile, and carry on doing your magic. Learning is essential for every human being on earth. I am volunteering my services at a school which is running for poor kids. i feel so satisfied teaching and helping kids read and write…People don’t praise your work rather they try to hurt your positive intention. Try to concentrate only on your work and you will see its result..
We just had a MoE experience in my school and the effect it had on the children was excellent. 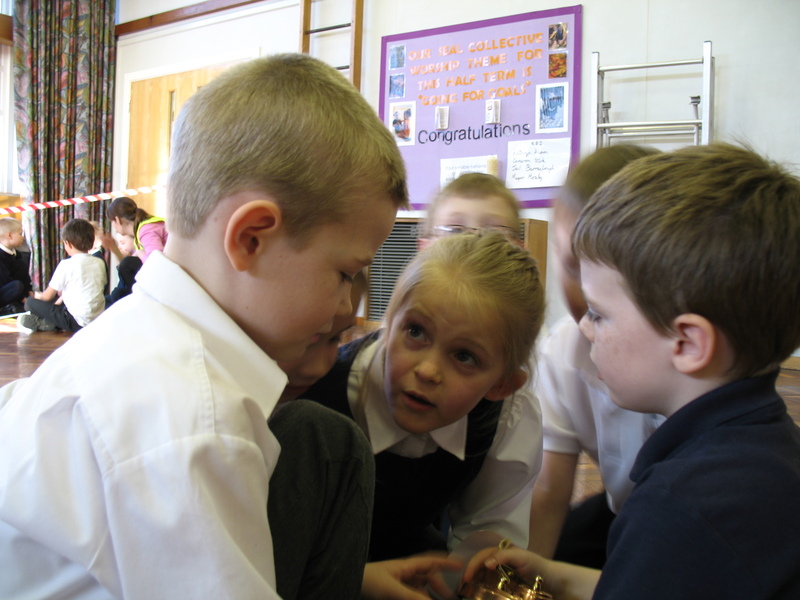 Children from Year 2-6 were placed in mixed groups and explored a dinosaur filled land as palaeontologists – solving different problems such as classifying dinosaurs, symmetrically completing dinosaur bones, analysing video evidence of dinosaurs and so on. One of the biggest eye openers for us was our Year 6’s reaction – we have a very boy heavy Year 6, yet they didn’t act ‘too cool’ for such things and actually some started to show real leadership qualities looking after the younger children in their group.